Add a custom text message with an optional soft or hard shadow effect. 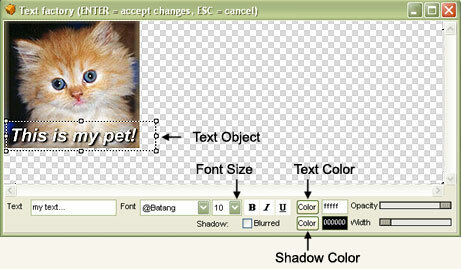 Text Object (preview area) - The text object shows a preview of the text label that is to be applied to the image, and controls its position and clipping. Left-click and drag to move the text object. Drag the handles to adjust the clipping rectangle. Text (text box) -Type the text to be used as the label. Font (drop-down menu box) - Define the font used for the text label. Font Size (drop-down menu box) - Define the font size used for the text label. B / I / U (toggle buttons) - Common text formatting parameters - Bold (B), Italic (I) and Underlined (U). Text Color (button and preview box) - Set the text color. Shadow Color (button and preview box) - Set shadow color. Blurred (check box) - Select between hard shadow (blurred OFF) and soft shadow (blurred ON). Opacity (slider) - Drag this slider to adjust opacity (including the shadow effect). 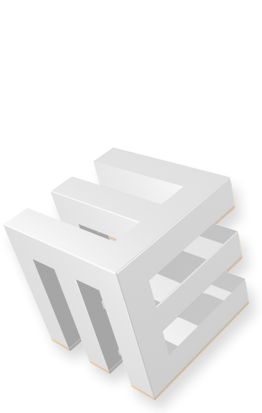 Width (slider) - Drag this slider to adjust the shadow size.